Former professional cyclist Tyler Hamilton will share his inspiring story ahead of the Berry Architecture Community Wellness Ride in Red Deer. The New York Times best selling author of The Secret Race will speak at the downtown branch of the Red Deer Public Library on Aug. 10. Hamilton will participate in the fundraising wellness ride the next day. George Berry, Berry Architecture and Associates owner and race organizer, said this year’s ride is special because it is the 10th anniversary of the fundraising ride. “Talking to people helps, it’s not a negative and it’s not a problem,” said Berry, adding the hope for the event is to break the stereotypes around mental health. He hopes to set fundraising and participation records. Berry hopes to raise $50,000 or more this year. In the past, the event has raised between $30,000 to $35,000. A good portion of the money raised comes from the cyclist who ask for pledges and raise money on their own, said Berry. Those looking to support cyclists can pledge online. The Red Deer business owner is hoping ridership is also up this year from the usual 40 cyclists to more than 60. All the money raised goes towards the Canadian Mental Health Association – Central Alberta Region and the Central Alberta Brain Injury Society (CABIS). Berry said all the money stays locally within Central Alberta to help with programs and education. Cyclists of all ages and abilities can choose to ride in the 10, 25, 50 or 100 km rides. 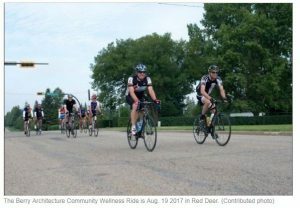 The 10 and 25 km rides take place on Red Deer trails while the longer distances take riders on the highway from Red Deer to Delbourne. Joining Hamilton will be Alex Stieda, an Edmonton-based former professional cyclist and television personality. Hamilton will be at the library from 7 p.m. to 8:30 p.m. on August 1o. For more information about the wellness ride, visit www.wellnessride.ca.